Savitri, a princess, fell in love with a poor man called Satyavan. Narada Muni warned her not to marry Satyavan as he would die at an early age. He even told her when Satyavan was going to die. But Savitri was unmoved and married Satyavan. On the day of Satyavan's death, she saw that Yama himself had come to take him. She begged Yama not to take Satyavan. But Yama said that no one could stop death. Savitri followed them for miles and miles. Impressed with her determination, Yama said, "I will give you two boons; you can ask for anything except the life of Satyavan." For the first boon, Savitri asked for the well-being of her father-in- law. For the second she cleverly asked for a hundred sons. Without thinking, Yama granted her two boons. At this Savitri asked Yama to return her husband because without him, she could not have any sons. 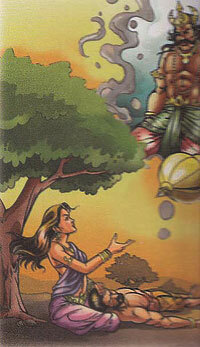 Defeated, Yama returned Savitri her husband.